Episode 3 is up and running, ready for your ears to devour it. It’s a massive beast at over 3 1/2 hours! Enjoy! In this episode, Tom and Kip discuss May and June new releases, preview two new 3rd Edition rules, cover the background of the PanOceania faction and talk about Paradiso missions 202 and 203. Then we offer some advice for AROs and how to deal with Total Reaction, talk about painting MDF terrain and announce the winner of our painted miniature contest. GenCon – Registration now open! PM Magno to volunteer. Muddle mint leaves with some crushed ice in cocktail shaker. Fill shaker with ice. Add rum, pineapple simple and lime juice. Shake very well. Strain into glass filled with fresh ice. 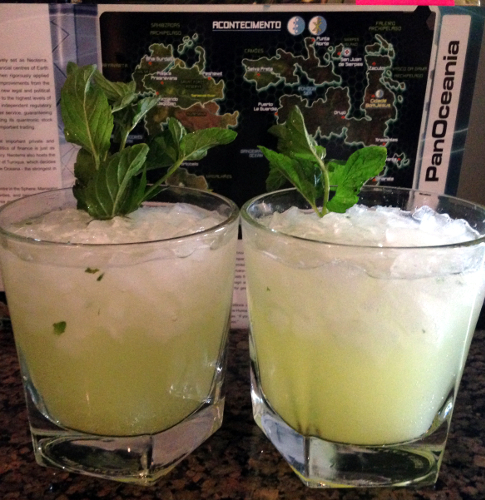 Top with club soda, stir, and garnish with large sprig of mint. New Rules for 3rd Edition! Winter is Coming – Something comes to Svalarheima in the next few months – follow Infinity on Facebook!! Congratulations to everyone that entered! See all of the entries on our Facebook! Here are the rest of Kip’s finished Aleph models, featuring Achilles and his Myrmidons. Kip has been busy painting up Aleph models this year. Here’s some of what he has gotten done. Tomorrow we will hit you up with Achilles and his Myrmidons! Artful terrain elements from Warsenal that Tom has painted up for our local Infinity games. Here are the MAS District 5 apartment buildings Tom built and painted up for our local Infinity games.